Welcome home buyers or congratulate sellers with this unique and memorable gift. A colonial-style house gift box opens to reveal essentials they never knew they would need - a flashlight, a first aid kit and more. With your own message printed on the gift box, this is the perfect gift to thank clients for placing their time and trust in your hands. First Aid Kit, LED Flashlight. Two Ceramic Welcome Home Mugs & Cocoa Mix. Each item is carefully assembled and your gift is packed securely to safeguard the shipping process. Personalize it! Your chosen name, date or special message can be printed on the designated space on the home's roof. Complete the personalization option during the checkout process. First Night Home Gift is a hand delivered gift. These gifts are delivered by one of our local design centers located throughout the United States and Canada. Same day delivery is available for most gifts when ordered before the cutoff time. The cutoff time for First Night Home Gift is 1 PM in the recipient's time zone. First Aid KitFirst Aid Kit Set with Nylon Bag includes all the essentials: bandages, alcohol pads, gauze, first aid tape, mask, gloves and much more. LED Mini FlashlightThis mini LED flashlight is a great value for your home! Keep one in your pocket, in the drawer, vehicle glove compartment, tool box or black-out kit. Needs 2 AA Batteries. 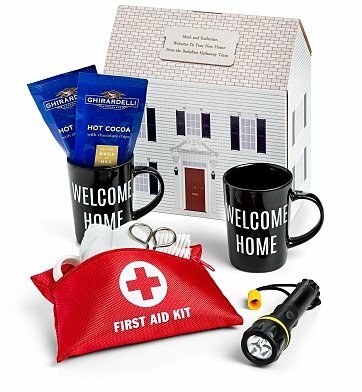 Includes Welcome Home Mugs, LED Flashlight & First Aid Kit. Arrives presentation-ready in our signature colonial-style house gift box.